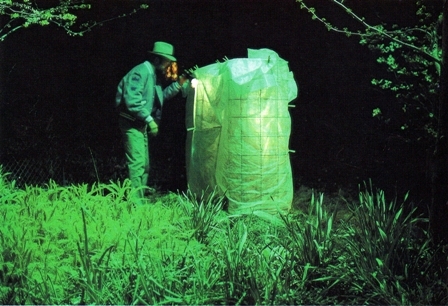 Floating row cover is a generic term for very lightweight, translucent material (usually spun polypropylene) that is placed directly over tomato cages and rows of food crops and ornamental plants to give frost protection and protect plants from insects and to protect them from various other unfavorable conditions. Floating row cover is so named because it doesn't have to be supported with hoops or other devices. It can just be set right on top of the growing crops, where it will "float" above them. Some of the various brand names include: N-Sulate, Harvest Guard, Frost Shield, Frost Blanket, Reemay, Agronet, Grow-Web, Plant Guard, Plant Shield and others. Covering plants with this material will give them 4-5 degrees of cold protection. Made of an extremely light-weight woven or sun-bonded synthetic material that allows light and water to penetrate, row covers are available in rolls five to six feet wide and in various lengths up to 375 feet. The material is reusable for several years if handled carefully to prevent tears. Row covers can be used early in the growing season to get cool season crops off to an early start. They work by trapping the sun's heat and warming the soil an extra 1 to 3 degrees. Crops, such as radishes, lettuce, spinach, broccoli, cabbage, cauliflower, peas, Chinese cabbage, beets, carrots, turnips and parsnips, can be seeded directly into the garden and covered at planting time, leaving enough slack in the row cover to allow for growth. The material is so light it literally floats on top of the plants as they grow. Secure the edges with soil; hold them down with two-by-four lumber or anchor them with U-shaped pins (made from coat hangers). Securing the edges prevents the entry of troublesome flying pests, such as cabbage worms, cabbage loopers and leaf miners, as well as marauding birds and squirrels. Use drip irrigation or a soaker hose to water plants under row covers. You also can use a sprinkler because the row cover material is water permeable. 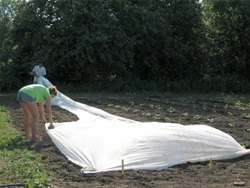 Use covers on cool-season crops only during the early part of the spring growing season. Remove the covers once unsettled weather has stabilized after four to six weeks. This allows beneficial insects, such as ladybird beetles, lacewings and pirate bugs, to enter the planting area. Thwart weeds that may thrive in a covered environment by using a mulch such as black plastic before planting. 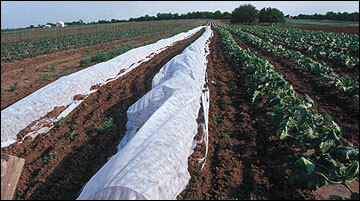 Row covers also can protect warm-season crops. Because they hold extra warmth, planting can be done up to two weeks earlier in the spring. Remember to uncover the plants that depend upon insect pollination for fruit production. These include melons, cucumbers and squash. Covering warm-season crops in the fall, well before the first frost, benefits plants in two ways. As in spring, a gain of a few degrees in frost protection often extends the growing season by several weeks. Extra warmth also hastens the ripening of fruits. Some, including, Colorado State University entomologists, have found that overwintering insects can be trapped under covers next to their favorite plants and be ready for action in spring. Some of these insects are tomato hornworm, onion and other root maggots, flea beetles and the Colorado potato beetle.